few35t, Squid711, AhmedTitef and 12 others thanked this. 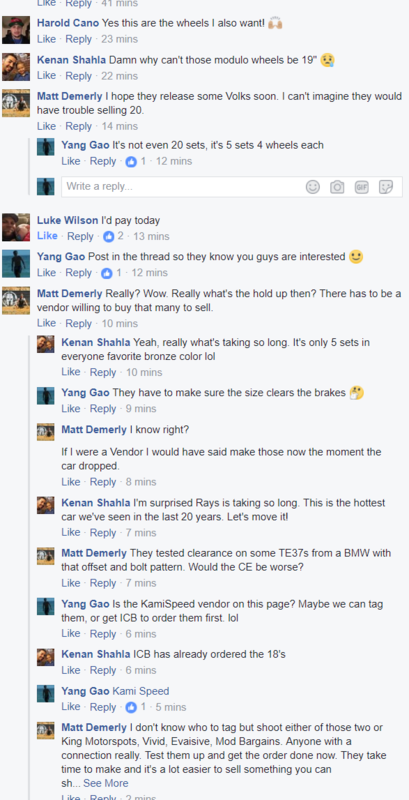 Sean12, romiata, metal_driver and 2 others thanked this. Need some 19 inch ce28s in bronze! Make it happen. Sounds good, I am no wheel expert and don't know anything about importing or special ordering wheels. But I think if you can get a batch of the following they will sell. Already working on 19x9.5 +42 or +35 5x120. CE28N were never made in 19x9 so that would require a specific CAD design for that size to make sure it meets all their JWL Spec 2 standards on top of a new mold, so we'd likely require more than just 5 sets lol. Since 19x9.5 +42 and +35 were made in the past we just have to make sure the 5x120 PCD doesn't change the structural composition and double check that it clears the Brakes (more so that the spokes don't hit the caliper). Besides that once I get the green light I'll be doing a group buy for Bronze. Are you guys looking at any gram lights, or advans? They both have a few 18 or 19x9.5 +35/38 options that already come in 5x120. The 57Transcend looks great. 57Transcend is heavier than the 57CR in the same size and offset. Sent a request to get added to the group! Don't have access as the company but I can go in personally. Limited production of Type R Civic for US market?